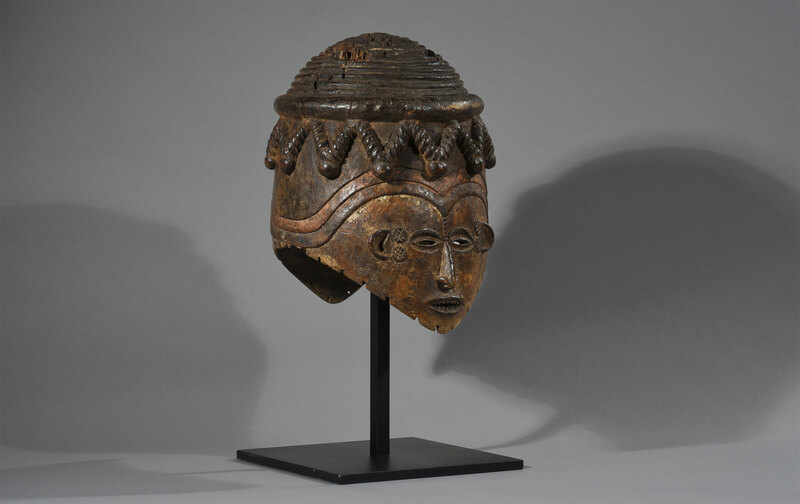 This unusual stylish and classically shaped Ukelle helmet mask is unique in its detailed carvings. 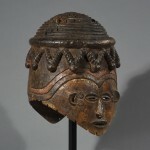 Similar masks often miss these details and are instead covered by antelope skins. 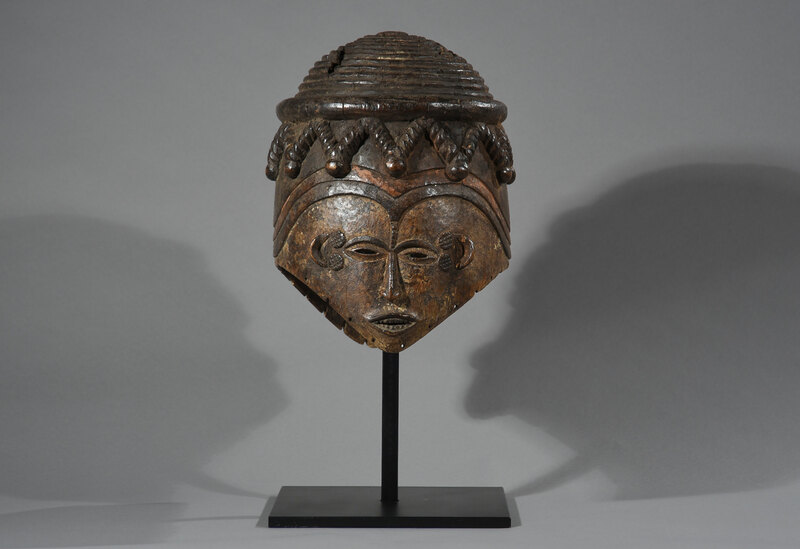 This mask is from the Ejagham peoples living in the Cross River region of Nigeria and Cameroon. 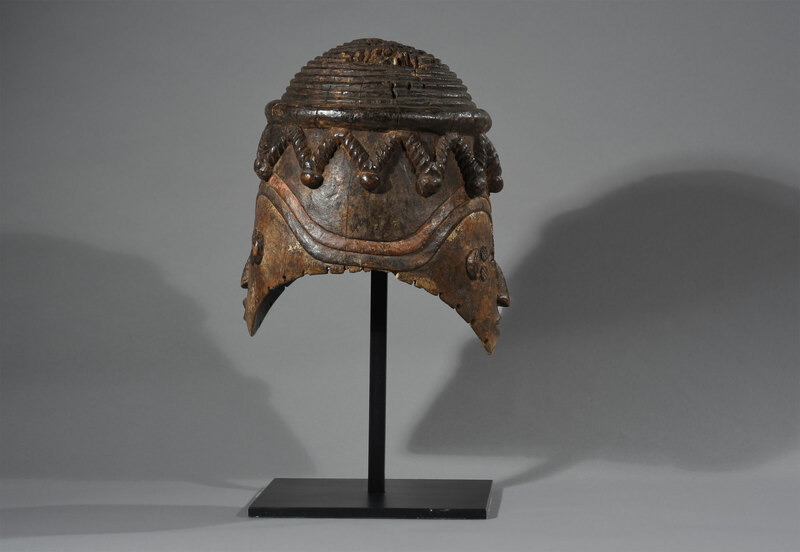 Members of a warriors’ association once used this helmet mask in performances. The performer looked through the eye holes of the larger male face. 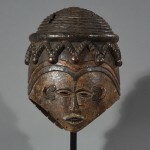 The smaller face of the mask is female and have filed front teeth and raised facial designs that indicate beauty and status. One face has small rounded protuberances arranged in a crescent shape on the upper forehead, in a vertical line extending down to the bridge of the nose, and radiating out under the eyes and along the cheeks. 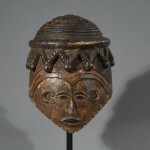 The elliptical-shaped eyes are carved through (allowing the wearer to see) and ringed with tiny holes pierced. The face is angular with a tapering chin. The mouth is slightly open with teeth indicated; the top incisor is cut to create a notch. The other face (woman), smaller in size, more oval in shape and with a raised ridge running down the center of the forehead and the length of the nose, are distinguished by a lighter coloration (part of the areas of encrusted kaolin is still visible). and large disk-shaped protuberances ornamenting the temples and the bridge of the nose. 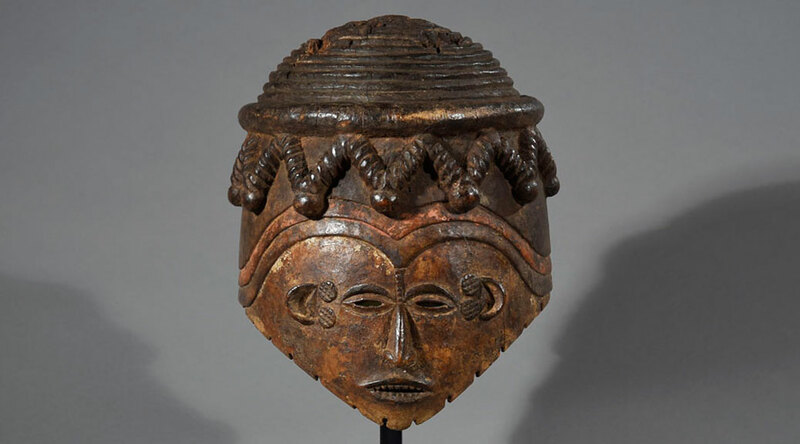 Wholes are made for fiber cord to be threaded through the holes along one side of the mask, and the edge is recessed on either side so that it can rest on the wearer’s shoulders. The top symbolizes bags containing porcupine quills, symbols of male valor. The Ejagham also known as the Ekoi people, are inhabitants of Kwa an ethnic group located near Calabarin the extreme southeast of Nigeria and extending eastward into Northern Cameroon. Ekoid Bantu languages are spoken by many groups, including the Atam, Boki, Mbembe, Ufia, and Yako. 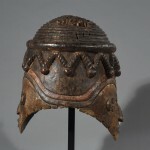 The Ekoi are related to the Efik, Annang, Ibibio and Igbo people of southeastern Nigeria and have lived closely with them and also claim to have migrated from the Cameroons to their area. The inhabitants of Kwa, located near Calabar, claim to be the first Ekoi people to have migrated from the Cameroons. 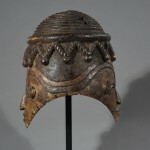 The Ekoi are best known for their headdresses. The Ekoi believe that the heirs of the first settlers of their present settlement own the land; while newcomers are not allowed to buy land, they are able to purchase rights of settlement. Ekoi men have traditionally hunted, while women have engaged in agriculture, raising yams, plantains, and corn (maize). Women also fish, and both men and women participate in weaving. Ekoi towns are ruled by councils of elders like their northern Igbo neighbours with whom they share various similarities, but townspeople are free to attend meetings. Native courts that were instituted under British administration provide an appeals system outside of the decision making by the elders. Representatives from various towns sit on the courts. 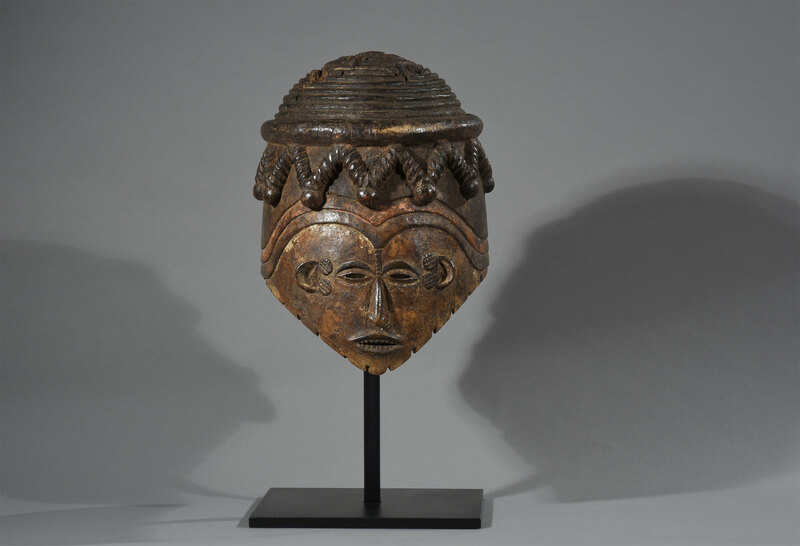 According to the Ekoi mythology the primary traditional Ekoi deities are Obassi Osaw, the sky god, and Obassi Nsi, the earth god, similar to the Efik. Ancestors and natural forces are also emphasized in Ekoi worship. Various Ekoi cults are devoted to the welfare of common activities, such as farming. Before the establishment of British colonial administration, the Igbo was a prominent Ekoi secret society that had strong social regulatory functions as well as influence in religious matters. Members of the Igbo used a form of ideographic writing called nsibidi, variations of which were formerly found among other ethnic groups in southeastern Nigeria. Provenience: Old private Belgian collection. Literature: Monday B. Abasiattai: A History of the Cross River Region of Nigeria. – Joshua Project: Ejagham, Ekoi of Cameroon Ethnic People Profile and Britannica Online Encyclopedia. Ekoi Retrieved 2009-01-2. – Gitti Salami: African Art History and Visual Culture.